State Fire Marshal Jim Kenkel joined the West Des Moines Fire Marshal Mike Whitsell today to demonstrate the new "fire safe cigarettes." State law mandates that those type of cigarettes be sold in Iowa beginning in January. Kenkel says they are still waiting confirmation on one death, and if confirmed, that would make the number of fire deaths 48 for the year. He says of the 47 confirmed fire deaths this year, 10 have been related to "carelessly discarded smoking materials." 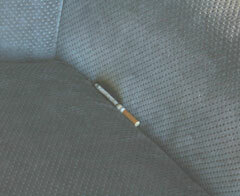 Kenkel says cigarettes pose a danger anywhere in the home if not properly snuffed out. Kenkel says cigarettes normally are left burning in the living room or bedroom. He says often a cigarette is left in the living room and someone thinks it is out and they go to bed and the cigarette starts a fire. Kenkel says if the person doesn’t have a smoke detector, they die in the bedroom, never knowing the cigarette started the fire. Kenkel says the new cigarettes should help. Kenkel says he new cigarettes will go out if someone is not puffing on them. 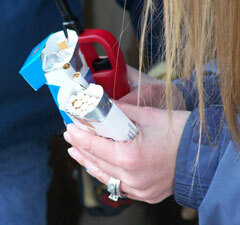 Fire Marshal Whitsell of West Des Moines says the new cigarettes are not a substitute for safe behavior. Whitsell says it’s an educational issue where people think putting out a cigarette is like putting out a candle, where it looks like it might be out, but it is not. He says cigarettes can look like they are out, but still smolder and start up again. Whitsell says the good thing is the new cigarettes bring the focus on the issue again. Whitsell says with the education and smokers double-checking their cigarettes, and the new fire safe cigarettes should help take some of the guesswork out of some of the cases. The new cigarettes use wrappings of less porous material that cause the cigarettes to go out if no one if puffing on them.